Interest in co-working spaces has shot up  over the past few years thanks to a plethora of great benefits. Smart co-works have added to the already tempting value proposition of co-working by adding services that accelerate business growth like automated receptionists, live chat features, and a multitude of other business solutions. In 2018, co-working is likely to become more popular than ever. Google Searches for “coworking” have gained steam over the past five years. A global survey also recently revealed that the number of co-working spaces worldwide increased 41% over this past year. Whether you are networking with peers or trying to court new clients, no one wants to come to the office above your garage for a meeting. For one, a home office isn’t as professional as a typical commercial real estate property. For two, navigating residential neighborhoods can be confusing and time consuming compared to reaching a spot in commercial districts of cities. Co-working spaces for rent are not only relatively accessible, they also offer many flexible options. These options can accommodate small companies and freelancers alike. Similarly, you can downsize your office once the heavy startup work is put in and employees begin to work more from home. In this way, co-working contracts offer you the possibilities and flexibility to adapt your work space as your business evolves! Working from home can not only get distracting, but it can also lead to procrastination. Commuting to a co-working space gives you the consistent schedule and dedicated environment you need to feel focused. Even better, having a separate work space helps you compartmentalize your professional and personal lives. Having a diverse array of professionals within your building is great not only for socializing but also for your career. Freelance writers️, web designers, consultants and more can be just around the corner. Any time you need a referral, some extra work done, or an “in” with a juicy client opportunity, you can just knock on their door. Co-working gives you access to things like water coolers, coffee makers☕, break rooms, and even foosball tables or a TV lounge depending on your arrangement. 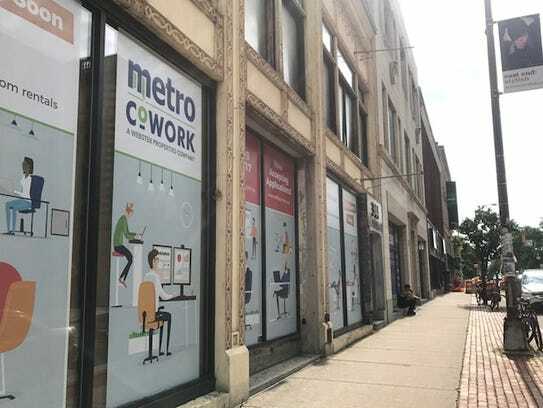 Many co-working rental companies like Metro Office Centers also offer incredibly helpful business services in addition to office space. For instance, we can provide you with an automated or live receptionist to help support your business, and we can optimize your Google My Business Listing to represent your co-working space as a true professional environment! Take a look at how the benefits above and the services we offer can transform your business when you find co-working spaces near you today!